I can't believe there's only nine weeks left until the 3 Day! It's been a crazy summer of planning and fundraising and I am so touched by all the support from people I haven't even met. For most people, the 60 miles of walking within 3 days is the intimidating part. But for me, it was raising money. I've never raised more than $300 before and I've definitely never been comfortable asking anyone for anything. For that reason, this experience has been an experiment in courage and creativity. Selling ads on this blog, offering to redo resumes in exchange for donations, crocheting beanies to (eventually) sell in my Etsy shop... these are all the things that I've been up to this summer. And even though I didn't meet my end of summer goal ($1,500), I feel pretty good about what I have raised and what we have coming up. 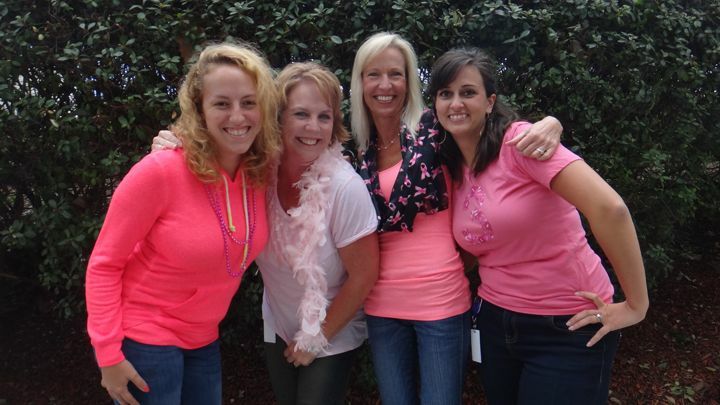 Half of my team is comprised of coworkers (the lovely ladies pictured with me above) and we are working now to put together a work fundraiser for October (which is Breast Cancer Awareness Month). I feel pretty confident that the fundraiser will contribute a decent amount to my goal. Marisa (far right) is our team captain and working with me on our lunch breaks to crochet beanies for the shop and I just learned about a great way to raise even more money through companies with matching gifts policies. So I'm on my way. But still. Nine weeks! You know what nine weeks also means? I better get walking. Although I wasn't scared by the walking at first, as we get closer, I'm starting to feel a little intimidated by the thought of walking 2+ marathons in one weekend. Also, to be honest I wasn't very good about my health OR fitness last week. School is now in full swing and my current class slammed me with a paper this past week on top of our regular classwork, so I've been more or less buried. But this week I start CrossFit (more on that next Monday!) and have a couple of walks and runs planned. My little fitness break is officially over. I have so much gratitude for the people who have donated or shown their support for this initiative and I plan on thanking each of them in a separate post following the 3 Day. But for those who have contributed and read this blog, please know that each of your donations has made me so emotional and kept me motivated to keep on this sometimes awkward, sometimes tough journey knowing that it will have a really great impact in the end. If you would like to donate, please click the link in the right hand column under "Donate" to reach my personal page.